MEGA* Swedish Wrap Die Kit for ALL sizes from Challenge Coins to Dime-sized Coins! Get the Complete MEGA Swedish Wrap die Kit all at once and save! This is the only COMPLETE Swedish Wrap die Kit that you will need to be able to further reduce ANY coin from the larger Challenge Coins all the way down to Dime-sized coins. *** Sometimes imitated but never duplicated, this set includes is the ORIGINAL 3 Swedish Wrap Die Set combo that I personally designed in mid-2016. Other inexperienced sellers offering similar 3 Swedish Wrap Die sets do not match up to the QUALITY of these dies and pushrods. For example, we manufacture our pushrods from top quality brass, and not out of less expensive and weaker aluminum or plastic, which doesn't hold up over time. 2.) 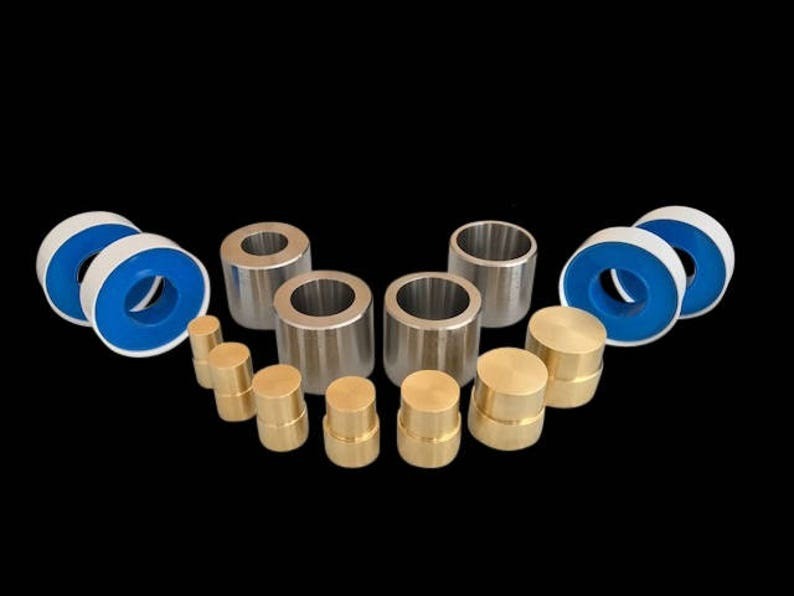 SEVEN high-quality hardened brass push rod plungers that are each DOUBLE-SIDED, giving you a total of 14 different-sized outer diameter push rod ends to compress your coin ring through the Swedish Wrap Dies. This new technique has revolutionized the way that larger coins are made into smaller-sized coin rings; all the while protecting the full detail of each coin. This technique is also great to use to remove the "wobble" that can occur when making coin rings. * April 26, 2018: "Hi, I received your die set today and could not wait to try it out. Attached is a pic of the Eisenhower Dollar ring I made for my first try. I plan to practice on several of these before trying a Morgan. I just started this hobby a month ago. I owe people like you a world of thanks for the You Tube instructional videos that allow us to learn a new skill/hobby. I am very pleased with your products. Keep 'em coming." * "Great set of dies. Silky smooth and work beautifully, can't see how they could be any better. Great addition to my tools. Thanks much!" * "Excellent quality! As I've said before I wouldn't buy these tools from anyone else in the future." * "A galaxy of stars wouldn't be enough to select from to reflect in how pleased I am with these new tools. Precision dies and cones and mandrel's epic quality and speedy shipping. I will continue to buy for sure." * "This is the coolest thing I've ever worked with. Super easy and amazing results. Thank you Martin for the superior tools and all the help. If you are serious about making coin rings, the swedish dies are a must!" * Love these dies. Butter smooth. Like having three shallow dies because I can see in them and not have to worry about any issues. All of my dies are from Martins shop. He makes top quality tools! Thanks Martin"
* "Hickory Dickory Dock, This Etsy Seller Rocks... Great Tools!!!!! Thanks For The Bonus It Works Great!!!!" After folding your coin ring (using the regular Universal Reduction dies), find the correct diameter brass push rod that covers the majority of the reeded-end of your coin. After annealing and wrapping the coin in Teflon thread tape, you place your folded-over coin ring into the appropriate sized die that it fits in, with the reeded edge facing UP towards you. Next, place the appropriate-sized urethane "disc" (cut from the strip of urethane pad that comes with your kit) onto the top of the reeded side of the coin, and place your push rod on top of that. The urethane disc creates a protective barrier between the two metal surfaces and helps to preserve the detail of the reeds as well as the brass push rod end. Begin to compress (extrude) the coin down the die, pulling the coin out often to both re-anneal and to re-wrap the coin in pipe thread tape, and when necessary; flipping the brass push rod over to the next smaller diameter size to continue compressing the coin down the die. 1.) The LARGE Swedish Wrap die (marked 1.4” at the opening end) can begin to reduce the larger-sized coins such as Challenge Coins, the American Silver Eagle, and the Morgan Dollar after they’ve been fully folded over. 1.) The MEDIUM Swedish Wrap die (marked 1.2” at the opening end) can further reduce Challenge Coins, American Silver Eagles, and Morgan Dollar-sized coins roughly down to a size 9 while only BOTTOMING the coins in this die. 2.) The SMALL Swedish Wrap die (marked 1.1” at the opening end) can be used to compress Half Dollar-sized coins down to roughly a size 3.5 with full extrusion, and can also be used to further compress the larger-sized coins such as the American Silver Eagle, Morgan/Peace Dollars, Challenge Coins, etc., down to a tiny size 1 when fully extruding out through the bottom of the die. 3.) The new TINY Swedish Wrap die (marked 0.9” at the opening end) can be used to reduce any fully folded-over US quarter, nickel, penny, and dime-sized coins. This Swedish Wrap die has the SMALLEST inner diameter exit opening on the market for coins to pass through, allowing you even to make the smallest “bead-sized” coin rings! To achieve the “straight-walled” look, I like to compress the coin ring using the Swedish Wrap dies and then expanding the coin ring on the ring stretcher until I get to 2 - 3 sizes ABOVE my final desired target ring size. Then, using my deburring tool, I will remove the appropriate amount of material from the INSIDE of the thicker reeded part of the coin to achieve more of a "comfort fit". Next, using the 17-degree dies, I will reduce the sides of my coin ring until I have reached my final target size. For those wanting a rounded-look to their coin rings, you can first compress the coin using the Swedish Wrap dies and then expand it on your ring stretcher 2 - 3 sizes ABOVE your final target size. You would then use the appropriate-sized Universal 17° die to first reduce the coin ring to get it close to your final target size, and then finish the coin ring off by using the 25° die to “tuck in” the sides more to achieve a more rounded “Fat Tire” look. 1.) TAKE YOUR TIME, especially when first starting out. I recommend Swedish Wrapping' a few rings out of clad coins to get familiar with the process. 3.) Use a LOT of pipe thread tape, and make sure to both re-anneal and re-wrap your coin ring often throughout the process. A 10-pack of the pipe thread tape can be purchased at HarborFreight.com for 2 dollars. 4.) Make sure that you firmly press the teflon-wrapped coin ring to make sure that it is seated evenly into the Swedish Wrap die before compressing with the brass push rod plungers. 5.) Press SLOW and make sure that the brass push rod covers the majority of the reeded portion of the coin. If it doesn’t cover enough of the reeds, the push rod could slip as you’re compressing it, possibly ruining the coin ring. You can fix this issue by placing the coin ring, (reeded side DOWN) into either your Universal 17°, 20°, or 25° reduction die to slightly shrink the outer diameter of the reeded side until the brass push rod better covers the reeds. * Be sure not to reduce TOO MUCH here, do just enough so that there's more coverage needed for the brass push rod. 6.) Make sure that you don't over press the brass push rods down the Swedish Wrap dies, especially when using a hydraulic press or an arbor press. At first, it's best to place the brass push rods into the dies WITHOUT the coin ring underneath. That way, you can get an idea of where the push rod "bottoms out" before actually compressing your coin. After some practice, you’ll be able to feel the resistance of when each push rod bottoms out in the dies. The tiny-sized coin rings can be incorporated into charms on necklaces, (see the listing photo for reference), bracelet charms, beads, pendants or even earrings. The possibilities are many! 1.) I don't believe in cutting corners; so my up-front costs are higher than anyone else's in order to be able to bring you the best quality material and craftsmanship available in coin ring-making tools. 2.) The level of quality of my tools is simply not duplicated elsewhere; as I use the highest quality Hardened Stainless Steel that is precision CNC-machined to the finest standards by expert machinists and hand polished to a smooth finish; unlike most other competitors' dies that have rough finishes to the inner die faces. 3.) Each die has also been precision engraved with the corresponding size opening for easy identification. 4.) My customers always come first! I can always be reached through Etsy, by e-mail directly, or by leaving me a comment on my blog site. 5.) I have a passion for both making coin rings as well as creating the highest quality coin ring-making tools on the market today. That's why I've created a platform where people can go to get their questions answered about all things coin rings; as well as ask questions and even leave suggestions. Please visit my new blog site at: CoinRingBlog.com for coin ring making tips, tricks, and tool updates. 7.) Why settle for buying inferior coin ring tools elsewhere? Buy from CoinRingUSA® and get the best in quality coin ring tooling! Thanks, and here's to your coin ring-making success! This set will be shipped by USPS Priority Mail with Signature Confirmation for U.S. residents. ORIGINAL Swedish Wrap Die Set for all Half Dollar, Dollar and Silver Eagle-Sized Coin Rings; BONUS items Included! Just opened the box today and I can’t wait to use them! Excellent seller! Super fast shipping! Superb quality products! Will absolutely purchase from again! Well done! Thank you!